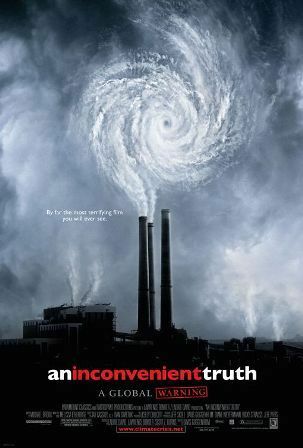 An Inconvenient Truth is a 2006 documentary film, directed by Davis Guggenheim, about former United States Vice President Al Gore's campaign to educate citizens about global warming via a comprehensive slide show that, by his own estimate, he has given more than a thousand times. Premiering at the 2006 Sundance Film Festival and opening in New York City and Los Angeles on May 24, 2006, the documentary was a critical and box-office success, winning Academy Awards for Best Documentary Feature and for Best Original Song. The film also earned $49 million at the box office worldwide, becoming the fifth-highest-grossing documentary film to date in the United States. The idea to document his efforts came from Laurie David who saw his presentation at a town-hall meeting on global warming which coincided with the opening of The Day After Tomorrow. David was so inspired by Gore's slide show that she, with Lawrence Bender, met with Guggenheim to adapt the presentation into a film. Since the documentary's release, An Inconvenient Truth has been credited for raising international public awareness of climate change and reenergizing the environmental movement. Appearances to the contrary, Mr. Guggenheim's movie is not really about Al Gore. It consists mainly of a multimedia presentation on climate change that Mr. Gore has given many times over the last few years, interspersed with interviews and Mr. Gore's voice-over reflections on his life in and out of politics. His presence is, in some ways, a distraction, since it guarantees that "An Inconvenient Truth" will become fodder for the cynical, ideologically facile sniping that often passes for political discourse these days. But really, the idea that worrying about the effect of carbon-dioxide emissions on the world's climate makes you some kind of liberal kook is as tired as the image of Mr. Gore as a stiff, humorless speaker, someone to make fun of rather than take seriously.